Preface: I started writing this post from Seat 14 F on an American Airlines flight from Denver to Los Angeles, far above the mountains flying southwest toward the low orange sun. That was September 2, 2015. And I finished writing it literally weeks later in Hamilton, New Zealand, on September 23. The first part of our trip was so busy doing things that it took a long time to get caught up on actually planning the next steps of the trip and writing about it. I guess you could say this is Day 1 of our big journey to the eastern hemisphere. Yesterday we finished moving out of our apartment in Denver, and then sold our Toyota Prius. This morning I did the final walk-through of the apartment with our landlord, and turned over the keys. Our official address is now in Aurora, Colorado, a numbered box at a service called Traveling Mailbox that provides mailing addresses for vagabonds. According to my employer, our insurance company, the bank, our credit cards, the United States Postal Service, and our new drivers licenses, that’s where we live. But that’s a bit of a fabrication. It’s sort of a virtual address, necessary because so many people we deal with can’t cope with people who don’t actually have a permanent home. Traveling Mailbox will digitally scan our mail as it arrives and then we can read it online, and tell them to either shred the hardcopy or forward it to us wherever we want. But if you drove to our “home address” you’d find it’s just an unmarked business in a commercial district of Aurora. If you consider our home to be where most of our “stuff” is, then we live in a storage unit next door to a sand and gravel company near the old Buckley Air Force Base. But I think it’s most honest and accurate to say we’re living out of our suitcases. It’s a weird feeling. I haven’t done this since 2012, and then it was just for three months as we traveled around the east coast of America. Now it’s for six months in countries more foreign than any we’ve ever visited. On our first vagabond expedition, in mid-2011, it took me a month just to decompress from the stress of moving out of our safe suburban home. But it wasn’t until about the fourth month that I really felt “at home” not having a home. I wonder if it’ll be similar this time. We woke up in a new upscale hotel on Broadway in Denver, called The ART. 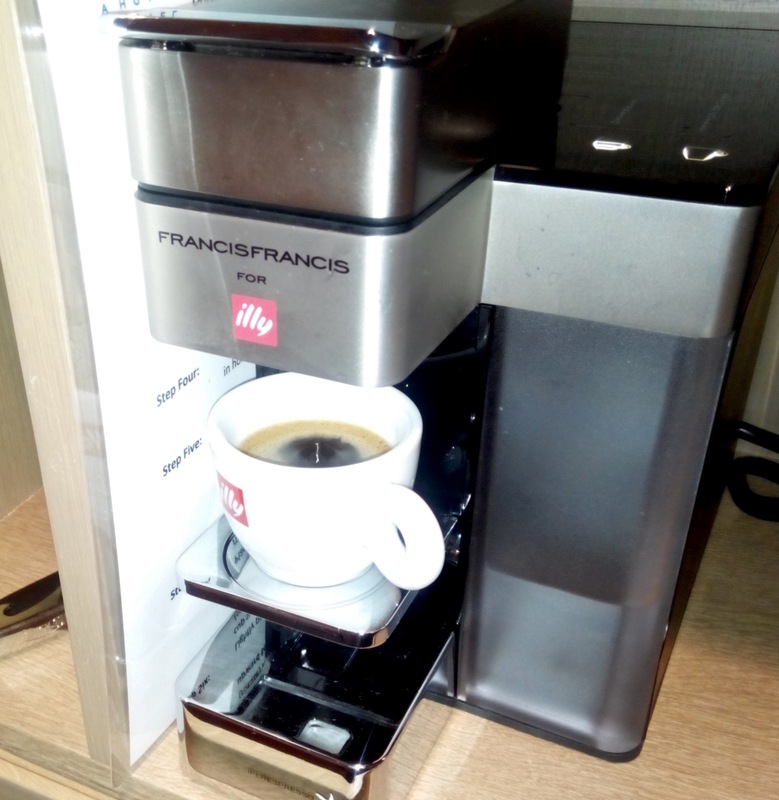 This is the first hotel I’ve ever stayed in that had an espresso machine in the room, rather than a Mr. Coffee type coffee machine (or nothing). I caught an Uber to our old apartment, did the walkthrough with our landlord, and then walked to City Bakery for breakfast. I treated myself to an iced mocha, with a sausage, egg, and cheese sandwich at the City Bakery. I walked back to the hotel, where Beth had already eaten breakfast at the restaurant. We packed up our things, and checked out, then spent the day at the Denver Museum of Nature and Science. That’s my favorite museum in Denver, and one of my favorite places anywhere. I wanted it to be the last taste in my mouth as we left Colorado. The DMNS was uncrowded, since school is back in session but only just barely. So parents aren’t taking their kids as part of vacation, and schools aren’t having field trips yet. We saw the Mystical Creatures exhibit, had lunch at the cafe’s salad bar, and then saw the Poison exhibit. Our last hour of R&R was hanging out in the atrium, but then it was time to head to the airport. The first flight of the day was on a little Embraer jet from DEN to LAX. No WiFi, no entertainment, no snacks, just a free Coke. So I ate a turkey sandwich for Supper #1 in the Denver airport before we left. The itinerary called for a 90 minute layover in LA, before boarding a very big plane, Qantas’ Airbus A380, for the 14 hour trip to Sydney. If you’ve never flown internationally to or from LAX, you have no idea what a terribly designed airport it is. To get from the domestic terminal to the international terminal, you have to take a bus, and then after the bus lets you off you actually leave the airport, walk down the road, and re-enter the airport. We did all that as quickly as we could, but it was all for naught. The big plane headed for Sydney had mechanical problems and we left America three hours late. Qantas gave us vouchers to get food and drink in the airport, which was nice, but there are very limited options in LAX’ international terminal at midnight. Many restaurants were closed altogether, and those that were open were just serving pre-made food, as their kitchen staffs had gone home hours earlier. It was a long night. Supper #2 was another turkey sandwich in the sleepy airport. But we finally left America in the wee hours of the morning. An hour or two into the flight, they fed us dinner — Supper #3 of the day for Beth and me. So now it’s about 5:00am on our bodies’ internal clocks. I was nearly delirious with lack of sleep, but at least I got a really good meal — baked cod, Thai curry and rice, veggies, and some yummy chocolate mousse dessert. The airplane was big. The A380 is the only passenger jet that has two full decks. Everyone knows the 747 with it’s shortened top level, but this one has a full length top level. I tried to get up there to check it out, but there was a gate blocking the stairs. So I stayed downstairs the whole time. For some reason, I’d thought this flight had WiFi onboard. In fact, I planned to make good use of six or eight hours of the long flight by using the internet to find and book some accommodations in Australia. But no such luck. They did have one powered USB port at least seat, so I could keep my iPad charged while I watched the second half of “Spartacus”. Some time later, while I was asleep, they served a snack I vaguely remember waking up enough to smell, but not enough to eat. A few hours later they served us a really good Australian breakfast. Some time after that, the sun came up again, at the end of a very long, dark night that lasted around 20 hours for us. And I guess that was the end of the first day of our big adventure. With the sunrise in Sydney, it was now Day 2 finally. Welcome to Australia!